The weather has just started getting cooler, but I’m already itching for soup season. Here’s one of my favorite fall soups. It is, of course, vegan. This is not my soup. My soup isn’t nearly this photogenic. 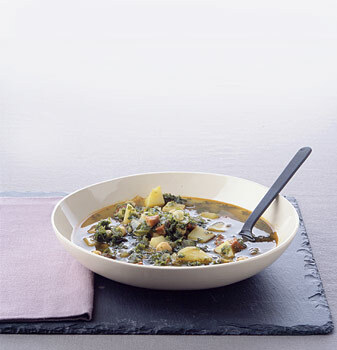 This is a filling soup that features calcium-rich kale and three different types of lean protein: soy milk, tofu, and garbanzo beans. It’s very simple and can be made ahead and allowed to simmer all day in a slow cooker. I prefer adding the kale just prior to serving it, but if you don’t mind squishy greens, just let them cook right in. Mix vinegar and soy sauce together in a small bowl. Crush 3-6 small garlic cloves into the mixture. I use at least 6. Garlic breath is the norm in my house. Slice tofu into 1/2″ cubes and place in a large bowl. Pour vinegar mixture over tofu and gently toss, making sure everything gets nicely coated. Allow to marinate for up to 48 hours. Dissolve vegan bouillon into 4 cups boiling water. Meanwhile, sauté onion in 1 tsp of olive oil in a very large, high-walled skillet with the heat on medium-high until translucent. Add cubes of tofu and allow them to heat through and brown very slightly. Pour your newly-made broth over the sizzling mixture and stir well. Add garbanzo beans. If you’re using the canned variety, rinse them in a colander first to cut down on the sodium content drastically. Add cayenne pepper, paprika, and mustard. Combine soy milk and corn starch. Whisk together until corn starch dissolves. Pour it in and stir well. While everything simmers, tear kale into 2″ pieces. Add it in and allow to wilt for about 5 minutes. Serve with a slice of whole wheat bread and a spinach salad to make a six-point meal that feels like a 10-pointer. This recipe yields about six cups and could really serve up to eight, but I’ve calculated everything into 1 cup servings. Adjust accordingly. This entry was posted in Diet and tagged garbanzo, kale, soup, vegan by Emma. Bookmark the permalink.